In the course of time natural wood can change its colour. In particular this process is assisted by sunlight. Therefore wooden arts and crafts should be presented on places without direct sunlight. The regular change of colour (normal growing darker) will even increase the aesthetic value of such articles. A relative humidity of more than 65% makes dry wood swell. Extreme humidity or temperature conditions are to be avoided. Wooden arts and crafts should not be touched by wet or greasy hands. Christmas pyramids should always be put up vertically. The wheel of wings must be put on carefully because the glass bearing is very delicate. It is recommended to put a drop of resin free oil into the bear once per season. This is good for rotation. The wings are to be added in an angle of 30° to 45°. The pyramid turns either slower or faster by changing the angle of the wings. There are suitable pyramid candles to be used in the candle sticks. The candles should not be longer than half of the distance between the candle stick and the wheel of wings. Pyramids with burning candles must not be left unattanded. It is not unusual to give an initial thrust to the pyramid, because sometimes the wings are in an awkward position. In addition, the pyramid, due to the arrangement of a focal character, is required for its first overcoming the more power. (The original equipment came with high-quality tea lights. These are available in stores). Tea lights from discount stores are cheap, but usually not enough to heat these candles. The same applies to fragrance candles. Lift the disk drive at something. Inspect and clean the (glass) stock and pour in a drop of resin-free oil. This is what we generally recommend one-time to do a season. Check the bottom tip of the needle, even if the bonded-steel ball placed in it. Defect bulbs have to be changed immediately. Only bulbs with the same voltage and watt can be reinserted. Since 2003 mains adaptors have been used in the Schalling company which turn off if overloaded. If the plug of the adaptor is separated from the mains it will be useable again after a short time of cooling. For the operation of the magneton, please put the rotor on the pole and lead the staff through the upper bearing. It is important that the small magnetic ball remains at the lower end of the rod. Put the rod with ball gently on the large stainless steel ball. 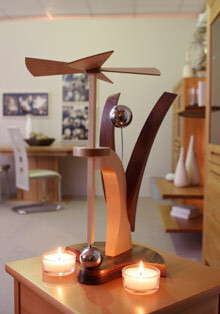 Then you can light the candles and even the rotor rotates through the rising heat. You may need to gently push the rotor to allow the first inertia is overcome. Even while using the rotor must always overcome the magnetic forces in the upper bearing and friction between the two spheres. Therefore, sufficient heat is important candles. Some candles are prone to longer focal length to the "drowning". If the force of the flames is not sufficient, please remove the excess wax or use a new candle. For a "friction-free" operation, we recommend from time to clean the contact surfaces and re-treated with oil or grease. A tiny drop is enough. From 2011, the great ball by a thread is height adjustable. By turning the ball anti-clockwise, the whole mechanism is raised. Turning clockwise lowers the bar with the rotor. Thus, a precise adjustment is possible. Ensure that the heat can rise more freely and vertically.